You don't need chlorine to clean your pool if you surround it with beautiful plants that do double duty to filter the water. This small and simple pool in Valencia, Spain is a great example of how natural swimming pools work. Designed and built by Urbanarbolismo, this backyard pool is surrounded by a regeneration zone and a whole array of plants that you can actually eat! Located in Moncada, this natural swimming pool is 130 sq meters, including the swimming area and the regeneration zone. In order to ditch the chlorine, the regeneration zone is used to filter and clean the water. It takes up about half the pool area, and consists of gravel, a kaldness filter and the plants. The water filters down through the gravel and plants and is then pumped back into the pool by the deck. 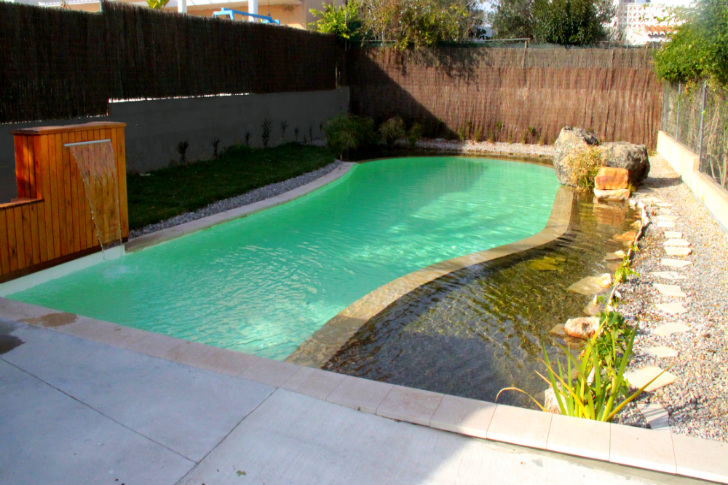 The pool’s surface is made from a material that repels algae growth and is easy to clean. Urbanarbolismo took into account the climate of the Valencia region and the necessary biological balance when selecting the plants. Many of them are actually edible, including Cress “Nasturtium officinale”, Celery “Apium nodiflorum”, Mint Pennyroyal “Mentha pulegium”, Aquatic Mint, Taro “Colocasia esculenta”, “Nuphar lutea”, and Eneas “Typha sp.” The plantings then look beautiful, work to clean the water and serve as a garden of sorts. A grass lawn adjacent to the pool soaks up water from the pool and does not need additional irrigation. Mowing the lawn also prevents the water from eutrophication, or over enrichment from the organic matter that could lead to algae blooms. Finally, to ensure that all solids are removed, the pool also features a species of native shrimp that eat mosquito larvae and keeps clean the gravel surface of the pool. I learned a lot about natural swimming pools by reading this article. I like how you explained that natural pools are free of annoying chlorine. I hope that sharing this article with my parents can help my parents to know what type of pool is best to install. That pool looks awesome. I would love to have any good swimming pool builder in Oakville such as Solda Pools construct one like it in my backyard. I really think it will look even better nearby our backyard garden. My husband and I love nature and anything that is natural while swimming is something our kids loves a lot. A natural swimming pool will definitely be something my family could enjoy together. So its basically an aquaponics ecosystem, but with shrimp instead of fish. so it is basically some type of an artificial small pond or lake. Has an ecosystem of its own minus the fish; includes shrimp though! Because the plants are using the pool water, this means they have to add more water than a regular pool. That is the drawback. Thanks Jennifer! Can you say how our articles are not Pinterest friendly? I LOVE natural pools and hope to build one someday. I wish your images were Pinterest friendly. I find so many of your articles to be great inspirations and would love to share them on Pinterest. Interesting! These days every time I read about some novel way to do them I think about what the drawbacks to the approach might be, because everything has pluses and minuses. With this, I suppose the shrimp might bite you, and you'd have garden to keep the plants in check. The gardening is a plus in my mind, especially as many of the plants are edible. There are may be some diseases that would be spread in this water that wouldn't in chlorinated water, and maybe some that would be inhibited. With careful consideration of that aspect, I suppose you could do this with a large public pool. Located in Moncada, this natural swimming pool is 130 sq meters, including the swimming area and the regeneration zone. In order to ditch the chlorine, the regeneration zone is used to filter and clean the water. The regeneration zone, which takes up about half the pool area, consists of gravel, a kaldness filter and the plants. The water filters down through the gravel and plants and is then pumped back into the pool by the deck. The pool's surface is made from a material that repels algae growth and is easy to clean. Urbanarbolismo took into account the climate of the Valencia region and the necessary biological balance when selecting the plants. Many of the plants are actually edible, including Cress "Nasturtium officinale", Celery "Apium nodiflorum", Mint Pennyroyal "Mentha pulegium", Aquatic Mint, Taro "Colocasia esculenta", "Nuphar lutea", and Eneas "Typha sp." The plantings then look beautiful, work to clean the water and serve as a garden of sorts. A grass lawn adjacent to the pool soaks up water and does not need additional irrigation. Mowing of the lawn also prevents the water from eutrophication, or over enrichment from the organic matter that could lead to algae blooms. Diagram showing the plant placement in the natural swimming pool.